Last month, the provost of Western Carolina University in North Carolina asked the public school's chancellor to approve an academic center funded by the Charles Koch Foundation, a private nonprofit run by the billionaire chairman, CEO, and co-owner of the Koch Industries oil and chemical corporation. The foundation funds academic programs, professorships, scholarships, conferences, lecture series and economics centers, all for the purpose of promoting the free-market agenda embraced by Koch and his brother David. The chancellor has come out in support, and on Dec. 4 the school's trustees will vote on the fate of the Center for the Study of Free Enterprise, which would launch with $2 million from the Charles Koch Foundation over five years and $1.4 million from the university. The proposed agreement has come under fire from the school's faculty senate, which voted 21-3 to oppose the center's creation. The group raised concerns about academic freedom, cost, reputation, and the lack of peer review. "The Charles Koch Foundation has previously set forth explicit expectations in line with their political views in exchange for monetary gifts to universities," the faculty senate said in a statement, "thereby constraining academic freedom by influencing and interfering with the development of new knowledge." Eighty-five percent of the donations — or $91 million — went to 147 Southern colleges and universities. The bulk of the money given by the four nonprofits — $77.7 million — went to George Mason University, a public school in Fairfax, Virginia. Much of that went to the school's Mercatus Center and Institute for Humane Studies, nonprofits housed at the university that focus on teaching and promoting free-market economics. But even when the GMU donations are excluded from the total giving, Southern schools received 45 percent of the remaining contributions. 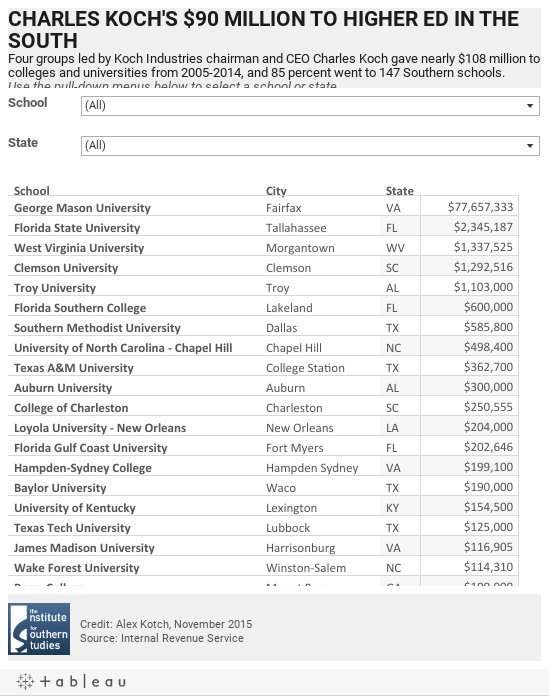 Besides GMU, the other schools that received the most money from the Koch foundations are all in the South: Florida State University at $2.3 million, West Virginia University at $1.3 million, Clemson University of South Carolina at $1.3 million, and Troy University of Alabama at $1.1 million. Looking at Koch contributions to schools by state, Virginia got the lion's share at $78.5 million followed by Florida at $3.3 million, the Kochs' home state of Kansas at $2.4 million, Texas at $1.9 million, and South Carolina at $1.7 million. Of the top 10 states for Koch higher ed contributions, six are in the South, with Alabama and West Virginia coming in at sixth and eighth, respectively. The four Koch-connected groups' donations to higher education have risen since 2005, when they gave $2.3 million to colleges and universities. The most recent tax return, posted to the foundation's website last month shows that the Charles Koch Foundation donated $23.6 million in 2014, nearly double the $12.4 million that it and the Fred and Mary Koch Foundation together donated in 2012. The latter foundation's 2014 tax return is not yet available. Why would so much of Charles Koch's contributions to higher education be going to schools in the South? The Charles Koch Foundation did not respond to requests for comment. But Ralph Wilson, a doctoral candidate at Florida State University who co-founded the student activist group FSU Progress Coalition and is active with UnKoch My Campus, a student group dedicated to uncovering the Kochs' influence on U.S. universities, thinks the Southern focus has to do with the brothers' political clout in the conservative region. Koch Industries has contributed heavily to candidates for state office in the South, according to the National Institute on Money in State Politics. Since 1994, the company, its political action committee, and its lobbying arm have invested the most money in state candidates, other political action committees, and outside political groups in Texas ($1.5 million), with Virginia in third ($670,000), Georgia in fifth ($275,000), and Florida in seventh ($200,000). State politicians in turn are often in charge of appointing public university systems' boards of governors and trustees who appoint top administrators, who then can influence the creation of academic centers, the donations a school accepts, and hiring decisions. Some politicians even become top university officers themselves. Take for example Florida State, where a contentious search for the university president took place last year. One candidate for the job was businessman John Thrasher, then a Republican state senator in Florida and chair of the re-election campaign of Republican Gov. Rick Scott, who received significant support from the Kochs. Thrasher's own campaign got $3,000 from Koch Industries over three election cycles, and in 1998 he was named legislator of the year by the American Legislative Exchange Council, a pro-business advocacy group that receives funding from Koch foundations. Thrasher, who twice violated ethics laws as a state representative and voted to cut Florida's higher education budget, was up against three candidates who many thought were better qualified for the university presidency. But the Scott-appointed chair of the school's board of trustees picked the presidential selection committee, which included many politicians, former politicians and lobbyists. Thrasher was chosen as president. In 2008, Florida State had entered into a $1.5 million funding deal with the Charles Koch Foundation that granted the foundation wide leverage in hiring decisions and imposed other requirements. Public outcry led to a revised agreement, which drew fire from students, faculty, and alumni for infringing upon academic freedom. In Thrasher's final months in the Florida House, he supported a bill that weakened donor transparency requirements for state universities. And after Thrasher became FSU's president, the school removed the requirement for a formal gift agreement — a written document "outlining the program to be supported and the schedule of contributions" — for donations over $25,000. "Thrasher, as a legislator and now as president, has enabled FSU's resistance to donor transparency," says Wilson. "He has personally perpetuated the university's misinformation about the Koch agreements as justification for refusing to meet with students and faculty, and maintained total silence regarding recent student and faculty concerns over the university's donor policy." University funding is part of a multi-pronged approach to social change that Charles Koch and his close ally Richard Fink devised decades ago. Fink, the Koch brothers' "grand strategist," is currently executive vice president of Koch Industries, president of the Charles Koch Foundation, and chair and CEO of Koch Companies Public Sector LLC, which coordinates Koch Industries' lobbying. Starting in the 1970s, Fink worked with Charles Koch to devise a three-part strategy of influence based on ideas from Austrian economist and free-market proponent Friedrich Hayek to spread their laissez-faire ideology as widely as possible. The first step in Fink's "Structure of Social Change" involved pouring millions of dollars into universities to produce what he called "intellectual raw materials" to support their political agenda. But these materials had to be packaged in a way that non-academics could understand, and that's where the second step in the strategy came in: Think tanks such as the libertarian Cato Institute, co-founded by Charles Koch and heavily funded by the Koch foundations, produce reports, policy proposals, and opinion pieces that turn academic work into political fodder. Next, what Fink calls "citizen activist" groups put the think tanks' ideas into action by advocating for the recommended policy changes. The Koch network includes a vast array of such groups, including the "social welfare" nonprofit Americans for Prosperity, which David Koch founded with Fink and North Carolina political mega-donor Art Pope, and the closely linked nonprofit Americans for Prosperity Foundation, which bankrolled the beginnings of the Tea Party. AFP spends millions on federal, state and local elections, often buying attack ads targeting opponents of their favored candidates. The Kochs and their companies' political action committees also donate directly to the politicians they hope will usher their policy preferences into law. While the Kochs are prolific donors to higher education in the South, they are by no means alone. Their close ally Art Pope, for example, has given six- and sometimes seven-figure donations to mainly Southern universities, much of it going towards free-market programs. The foundation of the North Carolina-based bank BB&T has given at least 63 "Moral Foundation" grants to universities that require the schools to offer a course centered on "Atlas Shrugged" by libertarian favorite Ayn Rand. And not all of the big donors to higher education are conservatives: For example, liberal financier George Soros and independent Michael Bloomberg have also donated heavily to universities, as Dave Levinthal of the Center for Public Integrity showed in his far-reaching investigation of the Koch Foundations' higher ed donations. The Kochs' giving, however, is more focused on a particular area — free-market economics — than most others' donations, and comes with more strings attached. The Charles Koch Foundation has in some cases proposed courses, sought to approve hiring decisions, and even asked for the names and email addresses of students in Koch-sponsored courses, as Levinthal documented. As university budgets suffer in the wake of a prolonged economic recession and amidst cuts by conservative state legislatures, giving to higher ed by the Koch foundations could continue to rise. While deals like WCU's free enterprise center are often approved, the Kochs' politically polarizing image sometimes derails these efforts: Suffolk University just decided to sever ties with its Koch-funded, conservative research institute; Brooklyn College reportedly rejected a multimillion-dollar gift from the Charles Koch Foundation last year; and the University of Dayton has stopped accepting Koch funding. Today the Kochs and their giving to higher education are under more scrutiny than ever. UnKoch My Campus, launched in 2013 by students and alumni of numerous schools and coordinated in part by Wilson and Greenpeace investigator Connor Gibson, has active campaigns opposing Koch money at several schools including FSU, George Mason, and Suffolk. Because of UnKoch's work, "students finally have the information necessary to distinguish an education that serves the student from a privatized education in service of a Kansas billionaire," says Gibson. "That couldn't be said five years ago." Charles Koch is the chairman of the Charles Koch Foundation, which spends primarily on educational programs and had $528 million in net assets at the end of 2014. It also funds free-market think tanks and conservative journalism. Last year, Koch was the sole funder of the foundation, giving $168 million, but in 2014 a number of family trusts, including one in his name, supplied most of the revenue. The Fred and Mary Koch Foundation, with over $30 million in assets after 2013, has Charles and David Koch on its board of directors and Charles Koch's wife, Elizabeth Koch, as its president. The foundation gives to universities, scholarship programs, and nonprofit organizations, including one that "teaches business and entrepreneurial education" in numerous high schools. The Claude R. Lambe Foundation, where Charles and Elizabeth Koch were directors, disbanded in 2013, but gave tens of thousands of dollars to universities in 2005 and 2009. The Charles Koch Institute, set up in 2011 as a 501c3 educational nonprofit organization, mainly funds its own educational programs and gives money to policy think tanks but gave tens of thousands of dollars to Indiana University, the University of North Carolina, and George Mason University from 2013 to 2014. Charles Koch is on the board of directors, and the institute had $290 million in assets at the end of last year.